Welcome to the new home of El Texa Grotto M.O.V.P.E.R. ; El Texa Grotto M.O.V.P.E.R has a rich history of tradition here in Fort Worth and Tarrant County. dedicated to promoting Goodfellowship, Friendship, and fun amongst Master Masons. The Grotto is an organization founded on the idea that Master Masons should be able to enjoy one another’s company outside the confines of the Masonic Lodge. Friendships formed through the bonds of Masonry can grow and come to fulfillment while taking part in social activities without infringing on the solemnity of Masonic ritual. We term ourselves the Master Mason’s playground, a place where fun and fellowship abound. Our members, who we refer to as Prophets, meet in locations throughout thirty-one states and the District of Columbia in the U.S. and two provinces in Canada. Each Grotto hosts activities unique to its own area, but all are founded on the same principle – good men having good clean fun in an atmosphere of friendship and camaraderie. Dinner @ 6:30 p.m. - Meeting @ 7:30 p.m.
As with most Masonic organizations, the Grottoes of North America participates in philanthropic work with children. Our particular area of concern is with providing dentistry for special needs children and funding for cerebral palsy research. 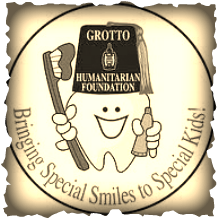 Many of our functions combine fun activities with the serious business of fundraising for our charity, the Humanitarian Foundation of the Grottoes of North America.